Do not confuse the title character of the greatest Shakespearean history, Richard III, with the flesh and blood king from whom the play takes its name and historical context. 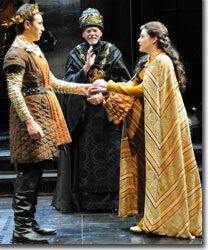 Like all the other histories created by Edward de Vere in return for the largest annual stipend on the Queen's list, Richard III was written with poetic license to propagandize and fortify the power of the Queen by adding legitimacy to her lineage, serve as a platform for the playwright to extol or excoriate his friends and enemies, and, whenever convenient, enhance the standing of the playwright's own family. 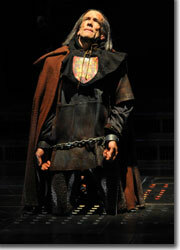 So, who is this character, Richard III, and why does he look and act as he does? The most prominent and notorious hunchback known to Elizabeth's court was Robert Cecil, son of William Cecil, Lord Burghley, Queen Elizabeth's chief advisor for nearly a half century. If William was the consummate spymaster and master of intrigue, Robert was his vindictive shadow, his bitter behavior retribution for the cruelty and prejudice shown him (because of his deformity, the result of a childhood accident) and the ruthlessness of the political lessons that were his education. 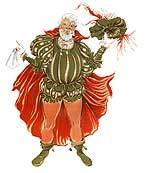 Robert made many enemies, including his brother-in-law, Edward de Vere. Whether director Jesse Berger or his leading actor, Andrew Long, informed their direction or performance with this Oxfordian perspective is immaterial to the fact that they fully realized the playwright's vision in this production. Long's mocking, silver-tongued miscreant amazes and repulses, as we watch him murder, manipulate, and ravage to feed his insatiable appetite for the ultimate weapon, the crown. With half a mind to the audience and half a mind to his rivals, Long's Richard is the consumate theatrical conceit in the canon. The rest of Berger's production is equally well conceived, showcasing the impressive depth of the company with nuance and power throughout, performed in David Kay Mickelsen's impressive costumes, before David M. Barber's classic and flexible settings, and lit, underscored, and choreographed with consonant effect. 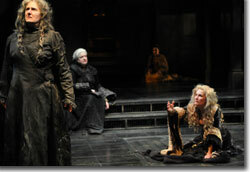 Of particular note are the performances and arguments tendered in the roles of Queen Margaret (Jeanne Paulsen), Queen Elizabeth (Kathleen McCall), Lady Anne (Nisi Sturgis), and the Duchess of York (Kathleen M. Brady) all widowed or bereft of children by Richard's actions. With dramatic art triumphing over historical fact, Drew Cortese's noble Henry Tudor, Earl of Richmond (Henry VII)—supported by John de Vere, 13th Earl of Oxford (Randy Moore), the author's great-great-grandfather—quickly establishes moral grounds for his campaign against Richard, bringing a strong sense of redemption and catharsis to the conclusion. 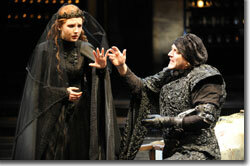 The Denver Center Theatre Company's production of Richard III runs through February 28th. 303-892-4100 or denvercenter.org.